AUTOPILOT to increase productivity and cement quality while reducing energy consumption in cement mills. Handle startup and cement changes and avoids plugging. Based on various process measurements (e.g., electronic ear, flowrates, pressures, temperature) and on-line particle size distribution (PSD) analyzers or off-line quality analyzers (e.g. sieves, Blaine), O_Mill is designed to optimize cement quality, productivity, and energy consumption of a cement mill circuit by adjusting various process quantities such as the fresh flowrate, separator and fan speeds, and damper positions. O_Mill is more than a piece of software! 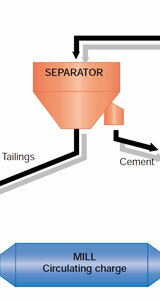 O_Mill has been implemented in various cement mills. Happy customers include: Holcim, Vicat. ”We have been collaborating with Online for several years to improve the quality of our products and to increase the performance of our production plants. We have obtained significant improvements due to O_Mill, and other projects will be implemented in the near future.” To show the merits of O_Mill, an article was published in 2013 in the group journal in collaboration with Online.